could be “destroyed” and the Prophet’s remains removed. (Photo: The Independent). 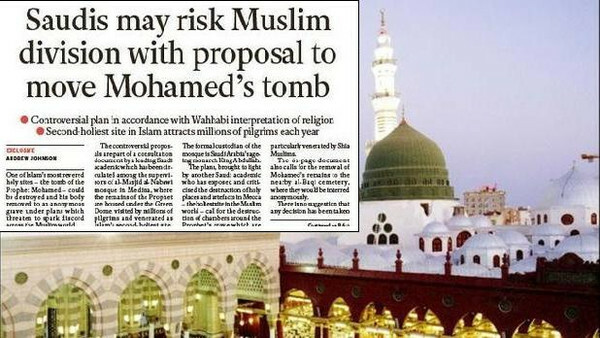 Riyadh/Mumbai: The Saudi Arabian authorities Wednesday denied any plan to move or destroy the Prophet’s Tomb adjacent to the Masjid al-Nabawi in Madinah al-Munawwerah, and termed the news reports being circulated in the media as false, fabricated and misleading. Putting a question mark over the publication of the news report – first carried by a British daily, and then followed blindly by many media houses especially those in India, a Saudi daily has accused ‘The Independent’ of ‘news theft, and ‘mistranslation’ of its report carried on the issue on August 25. “There is no question of moving, destroying or making any change in the present status of the Prophet’s Tomb”, a top Saudi official is quoted as saying by the local media. He also rebuffed the said reports as misleading, fabricated and totally false. “This is something which we cannot even dream of doing. The report is baseless”, he said. Meanwhile, Mowafaq al-Nowaysar, the Deputy Editor-in-Chief of Saudi newspaper The Makkah accused the Independent of “theft,” claiming they have “robbed” one of their journalists of his efforts. In an editorial on Wednesday, Nowaysar said the Independent “fell in the trap of misunderstandings after it mistranslated” an Arabic article that was posted in Makkah Newspaper on Aug 25. 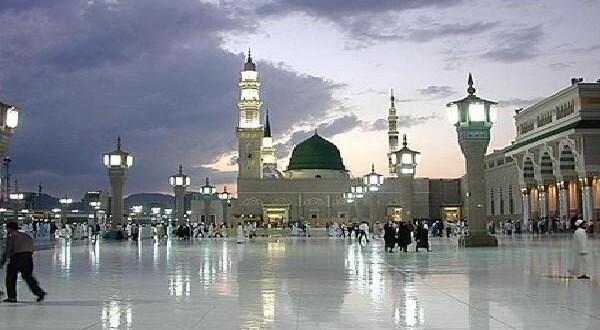 On Monday the British newspaper reported that the tomb of the Prophet Mohammad in the holy city of Madinah could be “destroyed” and the Prophet’s remains removed to an anonymous grave. The article states that there are calls for the Prophet’s tomb to be “isolated,” not destroyed, explained Nowaysar. He also accused The Independent of previously stealing content from his newspaper. The Independent is claiming the story as an exclusive, and many media outlets around the world carried the report having credited the paper as breaking the story. Following the publication of the report in Bangladeshi media, Ahle Sunnat Wal Jamaat, a religion-based organisation, has announced to lay siege to the Saudi Embassy in Dhaka on Sunday. Speaking to Al Arabiya News on Wednesday, Omar al-Mudhwahi, the Saudi journalist who wrote the Makkah newspaper report said: “If they insist on stealing my work, at least they should allow me to provide them with an accurate translation … I would be glad to”. “The information for our article was brought to our attention by the Saudi academic Dr. Irfan al-Alawi, who had read directly the work of Dr. Ali bin Abdulaziz al-Shabal and was concerned by its content. This follows on from previous Independent articles over recent years about the approach of the Saudi authorities to historical sites in Makkah and Madinah,” Gore said. The news has also hit headlines in the Indian Urdu dailies with quotes from Saudi Arabian authorities who denied the report as baseless. The Urdu dailies also criticised the Indian media houses of carrying the Independent report with verification. “The Indian English dailies not only carried The Independent report without the needed verification but they also deleted some paras in the report that contradicted claims made by in the UK daily’s report”, a Mumbai based Urdu daily said. The Islamic Educational, Scientific and Cultural Organization (ISESCO) roundly condemned untrue allegations published by Andrew Johnson in the British newspaper The Independent, in which he says that the Saudi authorities are considering a presumed proposal formulated in a consultation document by a local academic suggesting to move the tomb of Prophet Muhammad (PBUH) to al-Baqi’ cemetery. ISESCO refuted the allegations as unfounded, deeming them a spiteful plot to malign Islam and Muslims and distort the image of the Kingdom of Saudi Arabia, which has always been the trusted custodian and guardian of the Muslim world’s holy sites and architectural heritage, and shown full sensitivity and commitment to the needs of pilgrims and visitors from all around the world. “This is a malicious slander meant to foment further unrest and plunge the Muslim world into irreversibly destructive strife, as part of a vast plot by criminal Zionism and colonialism to exacerbate the deadly sectarian divide and terrorism plaguing the whole region,” ISESCO went on. ISESCO also called on Muslims everywhere to reject such vicious and erroneous claims, stressing that the Prophet’s tomb is and will always remain intact. It also invited Saudi Arabian authorities to sue both the journalist and the newspaper for publishing such unverified material and hideous propaganda. Yet another article about the destruction of the Prophet's grave is published and I catch the story early as it's released. Social media is absolutely livid. I'm getting tags, messages, and posts directed at me as everyone is inquiring about what is going on. Why me? Living and studying in the City of the Prophet Muhammad is a mix of having a guilty conscience wrapped in a blessing. We constantly say it's not something we ever deserved. But it's a blessing we have to constantly be thankful for and live up to the legacy of this city. Everything about being here reminds us of the responsibility. We are studying the faith that two billion people hold dear, in a tradition of over 1400 years, in the same location that the most beloved person to these two billion taught it in… the city of Madinah, one of the holiest cities in all of Islam. The Prophet's masjid— Al-masjid Al-Nabawi —the world's oldest Islamic institution is the legacy of all of Islamic civilizations, scholarship, and history. All of it traces back to what every single Muslim shares and holds dear about this city. Not only because the masjid serves as the world's oldest Islamic learning institution, but because Muslims know the exact location where the beloved Prophet Muhammad is buried. Madinah is where I read the article published by the Independent. I immediately send messages to my friends and contacts that are researchers at the Center for Historical Studies and Research of Madinah – to verify the news. My friend and long time researcher Abdullah Kabir Al-Shanqiti responds right away. He had already heard about the article. Many of the researchers, as well as the British-educated director of the center whom I know well, speak English. We have a conversation to discuss the details of the article and it is conclusive. Divisively worded to bring about an intended response, almost all of the facts in the article are not only out of context, but embellished or completely untrue. The article is laced with references to sectarian differences, and even manages to fit in a mention of ISIS for effect. The source mentioned in the article, Dr. Irfan Al-Alawi, of the Islamic Heritage Research Foundation, represents a polarizing organization called the Center of Islamic Pluralism based out of Washington D.C. The background, connection, and history of the organization and Dr. Irfan Al-Alawi is deserving of an entire separate article. The timing of this article was something that came to light as research was done by close friends that showed that the Independent regularly posted articles every year that seemingly recycled the same story regarding the destruction of masjid Nabwi, Mecca and/or the Prophet's tomb. These articles date as far back as least to 2011. Dr. Alawi is consistently used as a source annually on this topic in 2011, 2012, 2013 and now with the most recent one in 2014. One can recognize a clear trend or what some might call agenda. Focusing on the facts of the latest Independent article, the article was pure tabloid—not journalism and certainly not news. Written not with intent to share an event, but a planned disposition for an intended effect. Worse, it seems entirely premeditated. The entire story plays off the words “proposal” and “plans.” Emphasizing the veneration of this site by all Muslims, Shia and Sunni, of all backgrounds to create a crisis —a strategic divisive effect. The reality is, there was no such proposal, and there were no plans. The article discussed a 61-page document by a “leading Islamic academic Dr Ali ibn AbdulAziz al-Shabal.” The reality is he is not a leading academic, unheard of by the Center of Historical Studies, and someone unknown until the Independent coined him as a “leading Islamic academic” figure. The document he wrote was a paper that post-doctoral candidates in Saudi Arabian universities write in order to reach the level of adjunct professor. Al-Shabal teaches at imam University. He submitted this paper to the Committee of the Presidency of the Two Masjids in order to establish credibility and at the end of his paper he made suggestions. He did not submit a proposal to the government; that was never intended—let alone accepted. It was an entry submitted to an academic journal that was taken completely out of context in the Independent article—no, not out of context, seemingly used for an intended purpose. The writer of the Independent article makes claim that Dr. Al-Shabal “calls for the destruction of chambers around the Prophet's grave ” and “the removal of Mohamed's remains to the nearby al-Baqi cemetery, where they would be interred anonymously.” A prominent and well known scholar and professor in Umm al Qurra University in Mecca, Saudi Arabia, from the lineage of the Prophet , Dr. Hatim Al-Awni Al-Sharif calls this a lie and the article a fabrication. He says that Dr. Al-Shabal in fact called for the “separation” of the grave from the masjid structure and not destruction of the tomb or removal and relocation of the grave. Dr Al-Sharif concludes that the academic paper went against the tradition and understanding of orthodoxy entirely and that even though the Independent was completely wrong, lied, and falsified what Dr. Al-Shabal wrote, it still is something that's rejected. Furthermore, Dr. Al-Shabal was painted as a “leading islamic academic figure,” yet he does not represent any kind of scholarly decision-making body, such as the Council of Senior Scholars whom the government directly seeks approval from. Nor does he represent the Organization of the Islamic Council, a 500-member body comprised of scholars from all over the world that's based in Jeddah. Nor does he sit in the Fiqh Council (alMajma' al Fiqhi) another international council that has members such as renowned scholar Sh Abdullah ibn Bayyah, and holds its meetings in Mecca. This single fact shows how little the Independent even knows about how scholarly bodies are petitioned when it comes to matters dealing with Islam's holiest sites. Flashback to last year—the Council of Scholars in Saudi Arabia oversaw the decision to expand the Prophet 's masjid. An official government proposal and plan was given to them for approval. The expansion of the masjid in this proposal required changing the place of where the imam leads prayers in the original masjid. For over 1000 years Imams have led prayer here. This proposal suggested—for the first time in Muslim history—that the imam would deliver sermons on a minbar other than the pulpit of the Prophet . The Council unanimously rejected the proposal with the exception of only two members who gave secondary suggestions. The King called for a readjustment of the expansion to demolish all of the 5 star hotels in the back of the Prophet masjid and expand in a direction that preserves the original building, pulpit, and prayer cove. I had to ask. How could the Council of Scholars, made up of at least one Madinan scholar, my own teacher, Sh. Muhammad Al-Mukhtar Al-Shanqiti, reject a plan and proposal to not have the pulpit of the Prophet moved, yet they listened to a plan for his tomb to be moved? It was something impossible. The problem of manufactured journalism is something we've seen more rampant today. A former CNN reporter, Amber Lyon, exposed that some news outlets even get paid by governments. Regardless, seeds of discord spread among Muslims throughout social media because of the pervasive and almost subliminal impact such media plays. Many went in deep hate mode and lunged full on attacks.. without checking the facts. When the facts were pointed out to many that the article contains false information, most seem to not care, “the reality is we can't forget that Saudi did…” or “but in Saudi…” type rhetoric spread. Even academics that lay claim to scholastic standard, even journalists, even educators… many fell prey to the exact intention of the article —the sowing of discord. For many equating Saudi to not just a government but to an ideology that pigeonhole others became comfortable, again. The “they” and “us” is something that spread through the discussions on social media, no matter which “spectrum” the person belonged to. The standing and representing movements rather than Islam again reared its ugly head. Many let their feelings dictate their rationale—it didn't matter if the assertions in the article are false, there is injustice that needs to be spoken against, and criticism that needs to be made. We must admit. We must be truthful. The realities of history, the truth of demolishing many archaeological sites, historical locations, and other damages to the two holiest sites in Islam is something that is concrete, recorded, and undeniable. There is no doubt, a time, a place, and a discourse that must be had on the destruction of historical sites (I plan on writing a critical analysis of the destruction and preservation of historical sites in the Haramain). However, many do not know about the existence and the work of the organizations to preserve historical sites. In fact, the Center for Historical Studies and Research of Madinah has an entire division that oversees preservation of archaeological sites in Madinah, makes recommendations to the government body overseeing expansion, and I have personally witnessed the director signing 18 sites to be preserved in the future expansion of the Prophet 's masjid. Another organization that does the same in Mecca is called the Al-Furqan Islamic Heritage Foundation, and many other organizations exist both in Mecca and Madinah that work to preserve historical and archaeological sites as best as they can. But what must be realized, what must resonate, is that there is no doubt that this strategy of manufactured journalism to sow discord is prevalent and strategically placed. Muslims cannot afford to fall prey to this. Muslims cannot accept to give up the ethos of our faith in verifying news, not spreading everything we hear, and lose sight of the brotherhood that unifies us to collectively speak out against injustice, oppression, and transgression in our faith. Muslims cannot fall into emboldening sentiments of partisanship and hatred that these type of articles wish for. Right now a correction of false information that's spread, an understanding of our history, our heritage, our tradition, and our knowledge must be sought. It is in these turbulent times that we clearly see the work of strategy in play, and it is in these times that we beseech our teachers, our scholars, our academics, our journalists, our educators, all Muslims to hold fast and not let distraction seep in. Not let the seeds of discord blur our vision. Not let the disagreements distance ourselves from the objective of reaching a mutual understanding. Holding tight to the same rope, the unity of Muslims, a mutual understanding, a strength must be kept. After my preliminary responses on Twitter, I had the opportunity to have an exchange with prominent British journalist Mehdi Hasan. The disagreement over the facts wasn't there. It was a deeper sentiment that the article targeted and wished to sow. We had a calm exchange, where we laid out our points. I pointed out the factual inaccuracy and emphasized that. And the exchange ended cheerfully with me offering him a cup of tea on his next visit to the holy city of Madinah and a discussion we can have—person to person. He happily obliged and said he was looking forward to it. And I responded; I assured him the Legacy of Madinah is alive and well and will continue to be. This legacy will always defeat those who wish the seeds of discord. The legacy of the Prophet that is ingrained in our faith to overcome and realize the bigger picture, know and understand not just the time to discuss disagreements but the place and environment as well, and to see through the elements that wish to sow that discord in our ranks. This is the type of discourse we should encourage to have with one another, this is the type of legacy that we should preserve. Let's uphold to that legacy, and not allow our discourse to be set by divisive elements and let discord sow in our hearts and ranks. These are from the hadiths of the beloved, our Prophet Muhammad and guidance from the Qur'an. That is the legacy we must carry. That legacy lives on… and will continue to live on. Hasib Noor, completing his final year in Bachelors at the College of Islamic Law in the University of Madinah, following undergraduate study in the US majoring Pre-Med & minor in Psychology.